My 1969 2+2 Series II Fixed Head Coupe. Jaguar E-type 2+2 Series II , US import. Engine: 4.2 Liter, 6 cylinder, 2 x Stromberg carburettor, 210 hp. VIN # 1R41657BW / Body # 4R36906 ? Engine # 7R36426/9 / 4-speed + Overdrive. 2001: Seen on eBay Germany 7-17-2001, #1615322720, 69037 Miles, for EURO 14750. Not sold. 2001: I offered owner EURO 12700, sold to me for EURO 13200. The car cost me US$ 12000. 2001, July 28: Brought her home on a flatbed for restoration. 2008, Nov. : EZpowersteering electrical steering assist mounted. This is a real joy to drive. 2012, Mounted a gear reduction Startermotor and a new Battery. Also a new 14 inch Steering Wheel. Gives me more legroom. 2016. 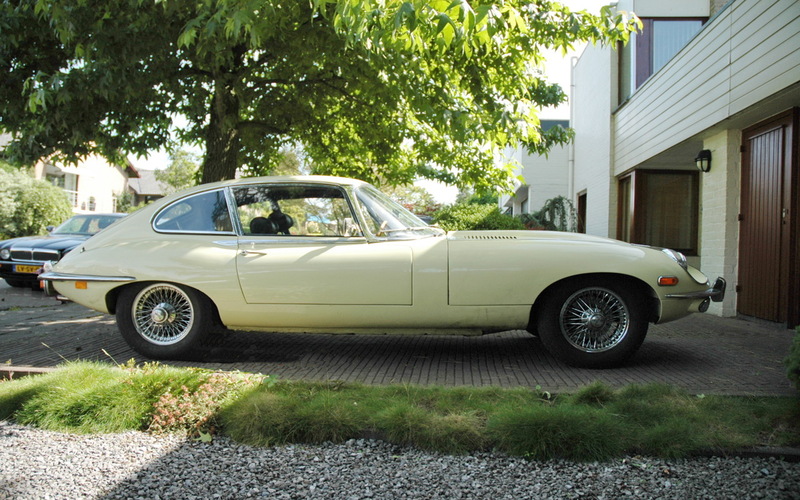 I SOLD MY E-TYPE !